WEE GEEM RETREAT is designed for singles and couples who are looking for a serene relaxation spot and a peaceful time away from the hustle and bustle of everyday life. There is a very comfortable king-sized bed with fine cotton linen for those who need a sound rest, or to catch up on sleep. The kitchenette provides you with all your essentials to make your stay comfortable. (Please note there are no cooking facilities within this room). Our mouth-watering breakfast such as orchard Bircher muesli, brewed tea or coffee orange juice, sourdough bread, real butter, delicious jams, and marmalades are available for you during your stay. (Please inform us if you any food allergies). The studio is spacious with a wardrobe and drawers to keep your belongings. The king bed can be separated into two king single beds if required. (PLEASE NOTE IF YOU REQUIRE 2 KING SINGLES THERE IS A MINUMUN STAY OF 2 NIGHTS). The bathroom is modern, private and can be accessed from the room giving you complete privacy. A DVD player, LCD TV (chrome cast enabled), Wi-Fi (the new NBN service), a reverse cycle heating and cooling which ensures you are warm or cool quickly is also available. The kitchenette is well-equipped with modern facilities such as a microwave, table-ware, cutlery, breadboard, wine glasses and a bottle opener. A spacious bathroom equipped with all your essentials which include a good sized shower, toilet and laundry trough. Also, luxury towels and bathroom mats are provided for you, as well as a small heater in the bathroom which warms up in no time. Wee Gemm Retreat has fantastic views, and the location is perfect. It is a short distance to the Warburton trail and the Yarra River. When you turn right at Warburton trail, it leads straight into the Warburton town or left it leads straight into the sleepy Millgrove. You have your own quiet and well-designed guest studio, with a separate entrance secured with digital code-lock for your safety. The security code is provided on booking and is known only to you and your hosts.
? You do not have to be responsible for any keys!
? The house is set on a large block with gardens.
? Guest are welcome to move around the gardens and enjoy the seating areas.
? We have two push bikes available (please bring your helmet). The main priority is to make sure that your experience at Wee Gemm Retreat is comfortable, private, relaxing and as enjoyable as possible. My husband and I live on the property and are often out exploring or walking around the region. We live a quiet life and encourage guest that value privacy to book with us. We are always happy to welcome, interact and to greet our guests. Otherwise, code access can be arranged. We are always glad to recommend lovely places in the valley to our guests. In case of any inquiry, we are always available 24/7 and happy to assist where possible with any special requests. Other things to note . Wellness packages are available from a simple personal meditation session to a full relaxation and stress detox weekend. Please contact Marisa for more information. #Car (35 min from Lily dale) approx. #Train and bus from Melbourne (line no 683). 2.24hr trip. Marisa’s home is located in Warburton, Victoria, Australia. We live in an extraordinary place where nature shows you its best. We have a fantastic river only minutes away from where you can swim, fish or just sit and relax. At the end of our street is the Warburton trail which allows walking and bike riding. The area boasts fantastic bushwalking paths that lead to the pretty waterfalls such as La La Falls or breath taking views of the valley. The Aqueduct is only a short drive to a peaceful walk but a great track view into our history. Ten minutes down the road is the redwood forest it is a magical place where you will find sculptures made from fallen sticks. Warburton golf course offers fantastic views with friendly service and cold beer. For the lovers of 4W driving; you will enjoy the local tracks that explore the region. Mt Donna Buang summits is an excellent display of snow in the winter if you are up for a little tobogganing. You can relax in the afternoon at the local cinema, or stroll along the main road where you can find an eclectic mix of shops showcasing the local talent. If you are like me and you love your coffee, then you will not be disappointed. There are many cafes in town offering great food, wine, and coffee. River view café has lovely Devonshire teas; three sugars have great coffee; Little Joes makes the best Pizza for a few suggestions. My love is the flying Apron in Wesburn which is 10 minutes down the road past Millgrove. The homemade pastries are lovely and the best Almond milk cappuccino in the valley. Warburton is surrounded by some fantastic places like Marysville, Healesville, McMahons Creek, local wineries, local strawberry farms, local stone fruit farms. Look out for Lemons on the road, local artists selling sculptures in their front yards, delicious honey, preserves, eggs and fresh produce. Warburton offers a beautiful experience for all walks of life. I look forward to having you stay at Wee Gemm Retreat. I love meditation, self-development, healing, painting mandalas and life itself. My husband has a love of soccer, cycling and motor sports, we both love to travel, good food, good coffee, good movies and good company. We feel so incredibly lucky to live in such a beautiful home with fantastic views. Exploring the environment and sharing our knowledge with our guests is something we enjoy. Our aim is to make your stay with us an experience you always want to remember. We will provide you with information on where to dine, fantastic cafe's, directions to the best views, shopping and much more. If you are adventurous enough, we can give you our bikes to ride to see the beautiful tracks along the Warburton Trail. # WE WILL DO OUR BEST TO ENSURE YOU HAVE A GREAT EXPERIENCE. #STAY IN A COMFORTABLE STUDIO WITH A PRIVATE BATHROOM, TV, INTERNET, AND KITCHENETTE. #SLEEP IN AN INCREDIBLY COMFORTABLE LUXURY PLUSH KING BED. #ADMIRE AMAZING VIEWS FROM YOUR ROOM. Marisa is a meditation teacher, relaxation expert, life past expert, energy consultant, essential oil wellness advocate and has been practicing for over 15 years. Her services are exclusive, and she cannot be found on the internet as her profession involves a verbal communication. If you are looking for a complete weekend of healing and relaxation, then don’t hesitate to contact her. #TREAT YOURSELF TO A RELAXING TMJ BALANCE-MEDITATION SESSION-AROMATOUCH SESSION OR PAST LIFE SESSION. (PLEASE CONTACT MARISA FOR MORE INFORMATION). We want our guests to feel wholly rejuvenated when they leave our home. WEE GEMM RETREAT will not disappoint. We are very much looking forward to meeting you. Reverse cycle heating and cooling and available in the studio for year round comfort. Reverse cycle heating and cooling are available with heater in your bathroom for those cilling days and nights. Enjoy the luxury of 500 or 1000 cotton thread sheets finished off with a cosy doona, stylish cover and a choice of pilows to ensure you have a restful nights sleep. Parking is right outside the studio door and under cover. Wee Gemm Retreat has free internet with the new NBN serving our home. Luxurious bathsheets, hand towels and bathmats are provided for you to complete your luxury stay with Wee Gemm Retreat. Wee Gemm Retreat has a very comfortable double recliner so you can sit back with a good book. Ground coffee, instant coffee, loose tea, tea bags, green tea, sugar, vegiemite, jams and honey, granola. The studio has a dining table that seat two people with a lovely view of the front garden and mountains. We have a large big sreeen Tv 55inch which is set up with Chromecast and a DVD player all with their remote controls. Wee Gemm Retreat has several board games, cards, mandala colouring books and pencils to enjoy during your stay. We have a great range of videos to pick from if you feel like relaxing in bed with a good movie. Wee Gemm Retreat has several decked areas with seating options to relax and enjoy our fabulous views of the mountains. Very friendly, cozy and amazing views! A must stay for a couple when travelling to Warburton! Charles was a pleasant guest, leaving the studio clean and orderly. Communication was good and even though there was a mild incident Charles was honest enough to let me know which was greatly appreciated. Over all a well mannered and respectful guest. We absolutely loved our stay. The studio is perfect and everything here, from free chocolates to room design, is thoughtful and makes your stay extremely comfortable and cosy. Recommended. Fabulous couple very joyful and respectful. Definitely welcome to stay with us again. Fiona was so delightful to have as a guest. She respected our home and was very friendly. We look forward to having her stay with us again in the future. 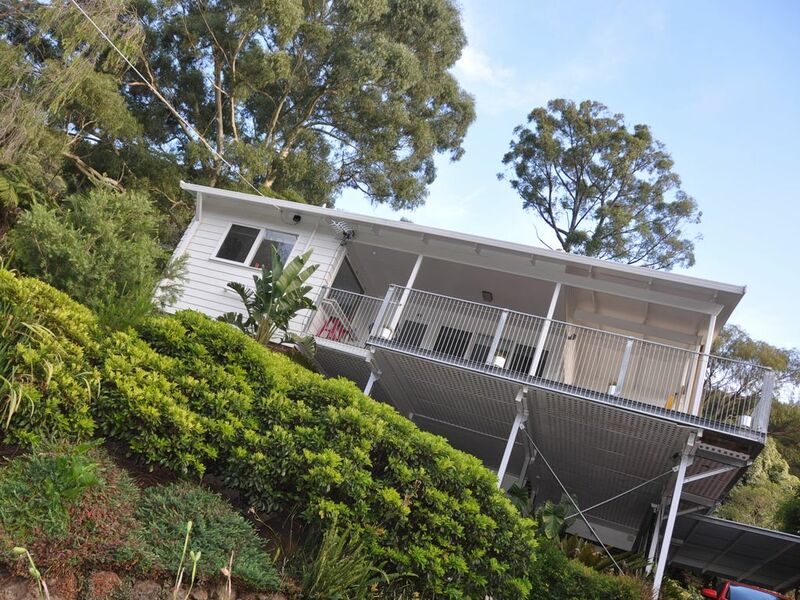 A quiet, relaxing retreat in the beautiful Warburton area. We were warmly welcomed by Marisa and Geoff. We enjoyed the breakfast and chocolates and the accommodation was clean and comfortable. We’d love to return in the future! A simply gorgeous, stylish and comfortable little retreat, surrounded by trees in a very quiet road within walking/riding distance from Warburton. Wee Gemm includes everything you could possibly wish for whether on a short or long stay, the owners have thought of pretty much everything! Breakfast was absolutely delicious. I will definitely stay again. We are glad you enjoyed your stay with us, and we would welcome you back anytime. Fantastic location. Host are wonderful. Than you for your message, Geoff and I really enjoyed your visit. You are a lovely couple full of joy and happiness.